Born on the island of Samos, off Greece, in the Mediterranean Sea, Pythagoras was the son of Mnesarchus. Little is known about his early life. 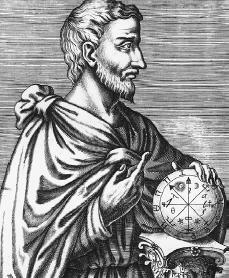 After studying in Greece, he fled to southern Italy to escape the harsh rule of Polycrates (died c. 522 B.C.E. ), who came to power about 538 B.C.E. Pythagoras is said to have traveled to Egypt and Babylon during this time. was probably Pythagoras who declared that numbers could uncover the secrets of the universe, limiting and giving shape to matter (anything that takes up space). His study of musical intervals, leading to the discovery that the chief intervals can be expressed in numerical ratios (relationships between numbers) between the first four integers (positive whole numbers), also led to the theory that the number ten, the sum of the first four integers, embraced the whole nature of number. So great was the Pythagoreans' respect for the "Tetractys of the Decad" (the sum of 1 + 2 + 3 + 4) that they swore their oaths (promises) by it rather than by the gods, as was normal during his day. Pythagoras may have discovered the theorem which still bears his name (in right triangles [triangle with one angle equal to 90 degrees], the square on the hypotenuse equals the sum of the squares on the other sides), although this proposal has been discovered on a writing stone dating from the time of the Babylonian king Hammurabi (died c. 1750 B.C.E. ). Regardless of their sources, the Pythagoreans did important work in extending the body of mathematical knowledge. Lately, I've been assigned some homework to research Pythagoras. So I went to this website, read the entire article, and found nothing on how the Pythagorean Theorem came about, or who the first was to think about this. It's just a tiny recommendment that it will help if you add more info to your article. Was he married ? Did he has children ? I would like to know more about Pythagoras' personal life.